Dolphin WaterSlides Information Request # 9278 From sectional custom- designed slides, to 1-piece insert slides, to the several we have for future development, Dolphin WaterSlides is the source for all your waterslide needs. We offer the safest and most beautiful slides at a fair price. 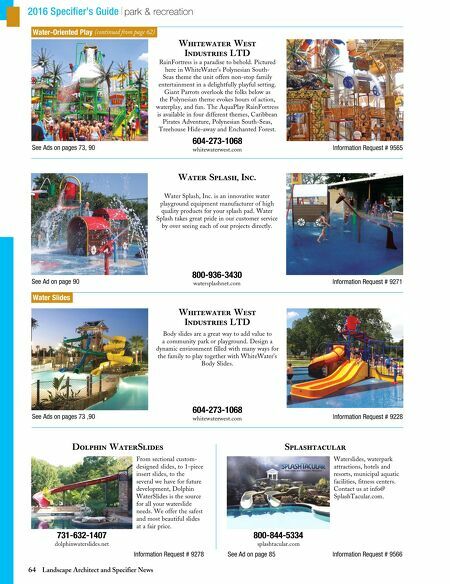 731-632-1407 dolphinwaterslides.net 64 Landscape Architect and Specifier News 2016 Specifier's Guide park & recreation Water Slides Water-Oriented Play (continued from page 62) See Ads on pages 73 ,90 Information Request # 9228 Whitewater West Industries LTD 604-273-1068 whitewaterwest.com Body slides are a great way to add value to a community park or playground. Design a dynamic environment filled with many ways for the family to play together with WhiteWater's Body Slides. 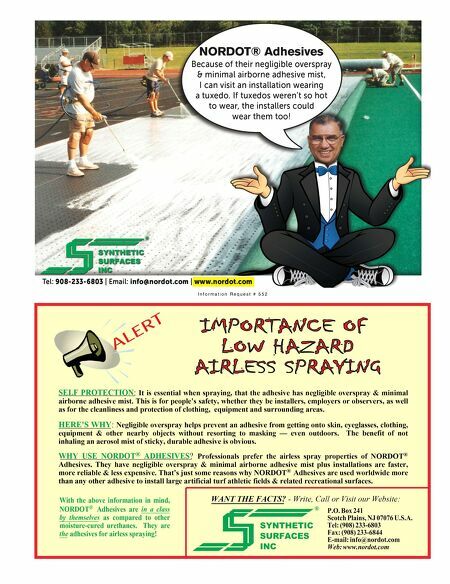 See Ads on pages 73, 90 Information Request # 9565 Whitewater West Industries LTD 604-273-1068 whitewaterwest.com RainFortress is a paradise to behold. Pictured here in WhiteWater's Polynesian South- Seas theme the unit offers non-stop family entertainment in a delightfully playful setting. Giant Parrots overlook the folks below as the Polynesian theme evokes hours of action, waterplay, and fun. The AquaPlay RainFortress is available in four different themes, Caribbean Pirates Adventure, Polynesian South-Seas, Treehouse Hide-away and Enchanted Forest. Splashtacular See Ad on page 85 Information Request # 9566 Waterslides, waterpark attractions, hotels and resorts, municipal aquatic facilities, fitness centers. Contact us at info@ SplashTacular.com. 800-844-5334 splashtacular.com See Ad on page 90 Information Request # 9271 Water Splash, Inc. 800-936-3430 watersplashnet.com Water Splash, Inc. is an innovative water playground equipment manufacturer of high quality products for your splash pad. Water Splash takes great pride in our customer service by over seeing each of our projects directly.